We’re back again with our weekly update. This week is looking exciting! Let’s have a look at what we’ve got going on. This week we featured in the Education section of the Guardian! It was great to meet Naomi Larsson and we really enjoyed reading the article. You can read the article here. A big thanks for the lovely write up, Naomi! The first North East festival celebrating women in the brewing industry is coming to Newcastle this week. We’re going to be hosting the bar for the symposium that is happening on Thursday evening. It’s going to be held in Venue, the space underneath the Student’s Union, from 7.30pm until 9.30pm. The Symposium will be a panel discussion, where each panelist will spend around 10 minutes discussing their experiences, and a subject of their choice. We will then spend around 30 minutes discussing topics such as sexism in the beer industry, what we’ve done to combat it, and what we can do better. Finally, we will then have a Q & A where the audience can ask the panelists questions. Special guests include Melissa Cole and Julia Austin. There will also be an event at the The Town Mouse on 7-10 March to celebrate and showcase women in the beer industry. This festival is designed to highlight women in brewing, bars, and everything beer, and to celebrate their achievements. It’s worth noting that every ticket for the symposium comes with a free pint of our beer! What’s not to love? We’ve got our hands on a new piece of kit. 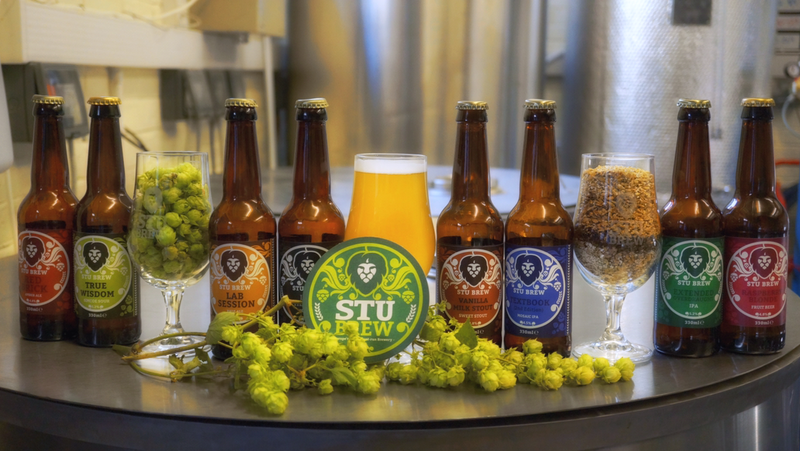 As many of you know, Stu Brew are strongly supported by the School of Engineering and it’s now the time of year where our research projects in the school are underway. This week saw the arrival of the dealcoholization unit. Keep an eye out for the results of the research sometime soon. Finally our secretary, Harry, was joined by a couple of members; Harsh and Cameron on a brew day on Sunday. They brewed Lady Liberty which is a beer we brewed exclusively for Pacific House. To try this get down to the wonderful Pacific House who will pull you through a pint… or two! That’s all from us for this week. Have a GREAT week! Stout, stout, let it all out! It’s that time again, the time for our weekly blog. We had an exciting week last week. On Thursday night the gang went down to the Town Mouse to celebrate the pub’s 2nd birthday! We had brewed a beer especially for the occasion, called All Night Breakfast. We had a great evening and enjoyed the great company. The beer went down really well! Then, on Saturday it was time to pop over to Tyne Bank Brewery for Craft Beer Evolution. We enjoyed meeting everyone there and hope everyone enjoyed our beer, Sticky Imp and Gose’berry Jam which we brewed in collaboration with The First & Last Brewery. Also, the society has been awarded a grant from Go Volunteer. With this grant we’ve been able to fund a fridge for the Home Brew Club to use to store prototypes. You can get involved if you fancy participating in Home Brew Club by coming along to The Buttery in Merz Court Tuesday at 5pm. Hope you enjoyed finding out what we’ve been up to this week! We’ll be back next week with more updates. First and foremost, this weekend there is a very special event happening that we are so glad to be involved with. Readers of this blog know our passion for the North East beer scene and this weekend is a perfect opportunity to get involved. We’re going to be at Craft Beer Evolution on Saturday. The event, put simply by Tyne Bank Brewery themselves, will see people come together in pursuit of great beer. We have brewed something really special for this event which we’ll be announcing on social media this week, so keep your eyes peeled! We’ll be there, alongside 10 neighbouring breweries, including Allendale Brewery and The First & Last Brewery. On the bar will be 10 amazing one off craft ales. During the day you’ll get the chance to discuss the North East craft brewing scene with the breweries! For all you foodie lovers out there Meat:Stack serving up the type of food that is the perfect accompaniment to great beer. We’ll be there selling merchandise too so come and say hi if you fancy picking up a snazzy new hoodie or hat! It’s called fashion, darling. We brewed Malliot Blanc yesterday for another canning run. This will also be available in keg! If you are interested in getting your hands on Malliot Blanc drop our sales team duo, Harry and Lucy, an email. That’s all from us now, but we hope you have a great week.